Rising 146 feet above the water, Arch Rock is a natural curiosity which spans fifty feet as its widest point. It was formed over thousands of years by wind and water eroding soft rock below, leaving only the hard breccia rock which forms the arch. Arch Rock is a geologic formation on Mackinac Island in Michigan. 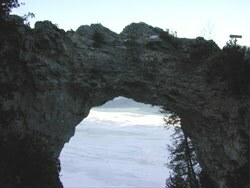 It is a natural limestone arch formed during the Nipissing post-glacial period, a period of high Lake Huron levels following the end of the Wisconsin glaciation. To this day Arch Rock stands on the Lake Huron shoreline 146 feet (45 m) above the water. Here are the latest photos of Arch Rock via instagram. If you have an instagram photo to share of your visit to Arch Rock, choose “Arch Rock” as your location and your photos will appear in the photo stream below.